I walked into the main building of The New England Conservatory of Music as a youngster in the Fall of 1975 when my older sister enrolled at the school. My childhood recollection is of a large staircase in a classic large atrium like something out of a 19th Century mansion. I left with the feeling that this was an important and serious place in the world. All these years later, I find that NEC is the oldest music school in the country — dating back to 1867. But the more impressive aspect of NEC is that its still a vibrant institution producing some of the best new musicians in a vast array of fields. 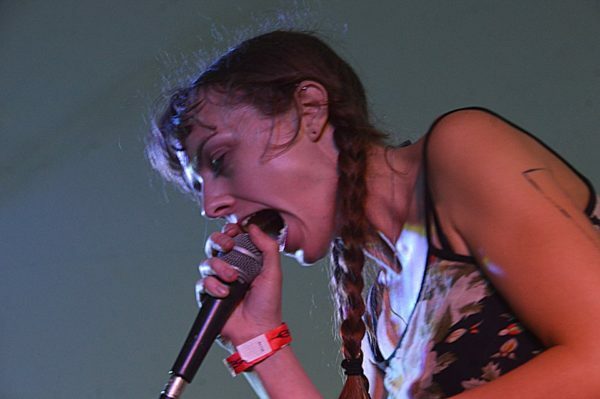 Last year we welcomed to these pages the amazing Guerilla Toss, a band consisting primarily of graduates of NEC. This year its Simon Hanes, a former sometime member of GT whose band Tredici Bacci reflects his own eclectic and unique approach to composition undoubtedly honed inside of the classic halls of the New England Conservatory. The music of Tredici Bacci is in some ways nothing like we’ve ever featured here before. Hanes’ fixation on Italian movie soundtracks from the 1970s is surely odd, but when the music is so meticulously constructed and utterly true to the form it has the effect of affording the listener the opportunity to conjure a movie plot in their imagination while Hanes soundtracks the image. At Sunnyvale in January, Tredici Bacci was a ten-piece band of prime musicians who projected Hanes’ compositions onto our imagined technicolor movie screen. The set was a relatively short thirty minutes, but accomplished what it set out to do — with precision, style and some humor. Tredici Bacci released their new album Amore Per Tutti (NNA Tapes) in November and this set featured two tracks from that album, a couple of older cuts and what appears to be some newbies. What is obvious from seeing Tredici Bacci live is that Simon Hanes has a fertile musical mind and we can expect to see more of Hanes and his many musical projects on these pages moving forward. I recorded this set with the Schoeps cards mounted at the front and center of the stage and mixed with a nice board feed. We were initially skeptical that the recording could balance the full band, but after a fairly standard mixdown of the sources, this recording really does a superb job of capturing the band in all its glory. Enjoy! Download this Recording in FLAC or MP3 from our Bandcamp page [HERE]. We had seen Guerrilla Toss a few times before this year’s Out in the Streets Festival performance that we captured. To us, and to anyone who has watched their ascent, they are one of those rare live bands that you seek out, who combine musical originality and daring with a live performance that’s bound to engage even the more pop-leaning subjects whom it reaches. It’s not insignificant the this band is signed to DFA, not only because that avatar of the previous decade conjures the best about the north Brooklyn scene, but also because they tend to sign acts that get your body moving, with whatever technology necessary. This Secret Project Robot show only extends the myth and the mystery of this band, being held in a creative space that, like most things north Brooklyn, was temporal but great. Add to that their specific choice of playing on the floor, rather than on stage, putting frontwoman Kassie Carlson, in particular, right in the audience’s face. If it wasn’t the technically strong show, in terms of sound system, it was absolutely one that showed what is best about this band’s interactive, high-energy live experience. This writhing, sweaty rager, featuring songs from the band’s DFA debut, Eraser Stargazer, showed that fun music can be cerebral, too. I recorded this set with Schoeps MK4V microphones not far from the band. The sound quality is reflective of the setup and the way it was recorded, and fits the moment perfectly. Enjoy! Guerilla Toss has been my white whale for the last year or so. There have been multiple missed connections when for one reason or another I was not able to record a local set, the most frustrating of which was when a massive snow storm resulted in the cancellation of their January show at Market Hotel. But I persisted and when the excellent Out In The Streets Fest announced that Guerilla Toss would be slated to play on a Saturday afternoon with an otherwise packed bill, we were there. The music of Guerilla Toss is an amalgamation of styles, the most resonant for me being the influence of Remain In Light-era Talking Heads. But what strikes most about the band live is that the musicians are phenomenally skilled at their craft — something quite apparent even before I learned that the band formed at the New England Conservatory of Music. While kinetic vocalist Kassie Carlson is the center of the focus on stage, the rhythm section of tribal drummer Peter Negroponte and Greg Albert’s meaty bass guitar are crucial to the sound and drive the live presentation. The music’s color is provided by the impressive varied keyboard work of Sam Lisabeth and the atmospheric guitar of Arian Shafiee. At Out In The Streets Fest on the border of Queens and Brooklyn on the grounds of the historic Onderdonk House, Guerilla Toss performed a nice cross section of their already extensive discography, two apparent new songs (“Can I Get the Real Stuff” and “Betty”), and a fairly obscure Tom Waits cover in a too-short thirty minute set that was both long on energy and compelling for all of the right reasons. 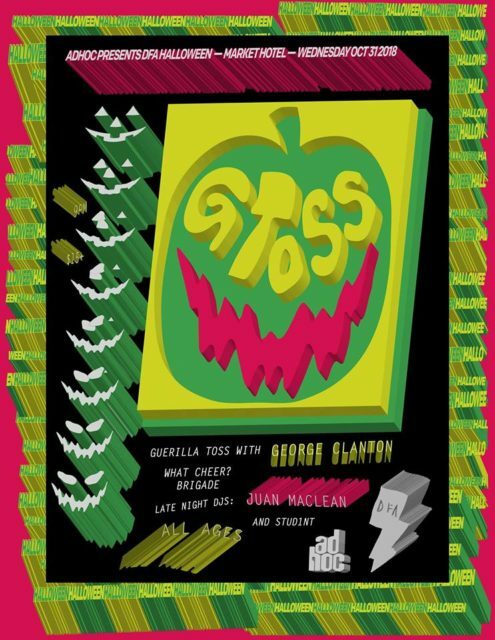 I suspect that Guerilla Toss will be regulars on NYCTaper moving forward and we’re excited to track their progress — fate willing. 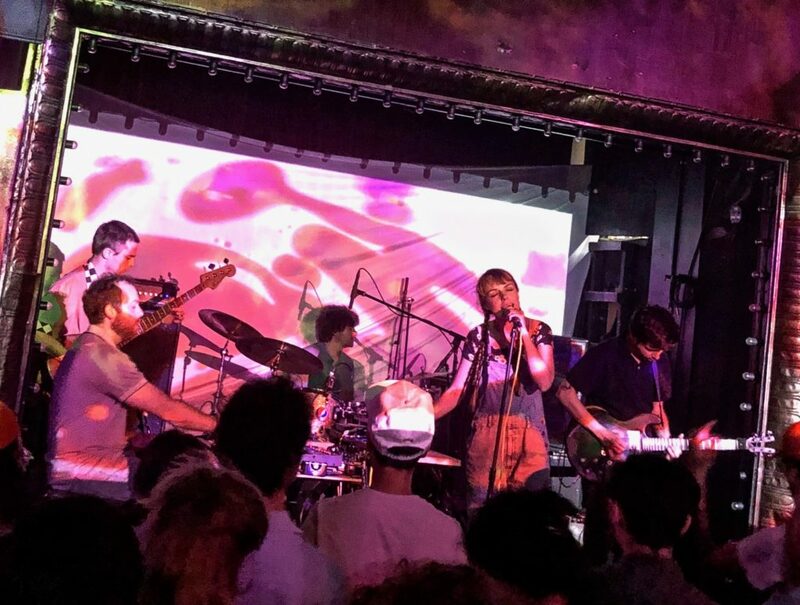 Guerilla Toss next play in NYC at the Summer’s End Festival at Aviv on September 3. 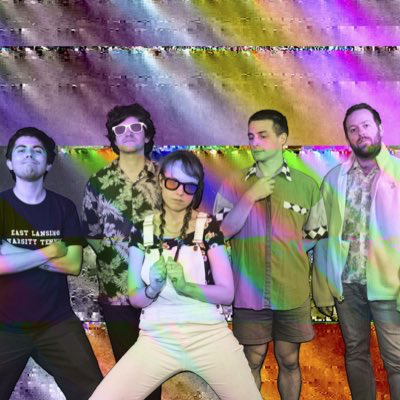 Just caught this: Guerilla Toss now have been added to the Oneida show at Secret Project Robot on July 30. I recorded this set with the outdoor-friendly Neumann large diaphragm mics mixed with an excellent board feed provided by FOH Cliff. The sound quality is superb. Enjoy! 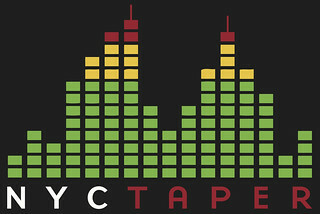 This Complete Show is now available for Download in FLAC and MP3 and to Stream at Archive.org [HERE].